​Over the years, those of us who train others to use the assertion-evidence model often hear sentences like those to the right. Believe us: We understand where you are coming from. We understand that you can be excited about using these techniques while being scared of rocking the boat at work at the same time. 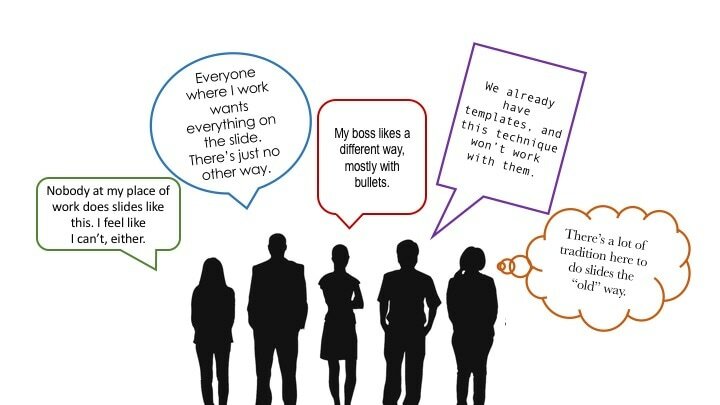 We understand that you may be employed at an organization that has deeply entrenched communication practices (often poor practices) in regards to how slides are created and used and shared. We understand that it can be hard to challenge those practices, especially if you are new on the job. However, we encourage you to stand steady, knowing that these techniques are powerful, persuasive, and entirely effective within technical and scientific organizations. Certainly, the assertion-evidence model lends itself endlessly to customization and tailoring, which is a great advantage to you as you discover how to meld your purpose, audience, content, and audience needs. But how can you get over being hesitant about using these techniques? How can you overcome resistance to their use at work, whether it is your own resistance or outside resistance from others? Be sure you can articulate why a short sentence header is better than a fragment. (You can read articles , you can read Chapter 5 from Slide Rules, and you can look to Critical Error 7 in The Craft of Scientific Presentations.) If you are going to convince people to let go of their one-word headers, you had better be able to explain why. Be able to explain why visuals are better than bullets (research about cognitive load exists). 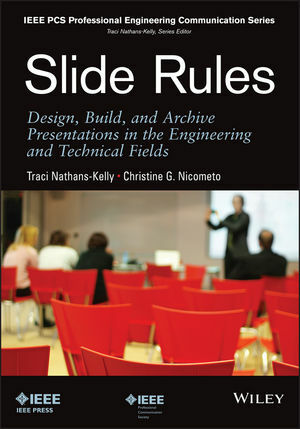 You can look to Chapters 6-8 in Slide Rules or Critical Error 8 in The Craft of Scientific Presentations for inspiration. If you are in a technical, engineering, or scientific organization, you can be sure that those organizations want to be seen as innovative and cutting edge. However, many people inside of these organizations hesitate to apply innovative strategies to their communication efforts. You can appeal to their sense of innovation to try on some of these techniques. If you want to try using the assertion-evidence model, you can also come at it slowly. Consider simply using sentence headers where fragments used to be. Gauge the response. Try fewer bullets and more visual evidence, perhaps in some slides, but not all of them. Gauge the response. If you get a positive or neutral response from your audience, that is wonderful! Even a neutral response or the absence of remarks about your slide design means that it was so well done that nobody noticed any change, which is great. (And then you can do more next time.) However, I would best that you will get some positive responses right away from your audience members. Many people know that most technical talks are boring. They likely sense that the source of the boring state arises is the traditional slide approach. For that reason, when you make a change for the better, the audience will realize it. The assertion-evidence model leads to speaker confidence, and this confidence will show during the talk. To the right are quotes from past adopters as evidence for how successful these methods can be. These quotes come from practicing engineers who have taken our workshops or classes. As you can see from Matt’s quote, he decided to be sneaky about deploying the assertion-evidence technique, and it worked out beautifully. If such a move makes you nervous, talk to your immediate manager first about trying out a few new things in your presentation. With the elements covered above, you should be just fine. For more information about how to combat resistance to change (either within yourself, your department, or your larger organization as a whole), please take a look at the book Slide Rules which will provide helpful techniques, solutions, and work-arounds. There, you will find ways to deal with reticent managers, archival solutions for clients and professors, working with bad templates, and more. Specifically, in Chapter 12, we speak to how to enact change within your organization. We encourage you to find your own style within the assertion-evidence model, and then please share your success stories with us! I shared this presentation approach with my dad, who owns his own company and attends some professional conferences for folks in the power generation industry. Using the low-text/high-visual approach, he gave a presentation to some chemists on water sampling at one of these conferences. He later told me, with some measure of excitement, that he had really connected with his audience. It was one of the most effective presentations he had ever given.